I'll take an eclipse any day of the week! You must be the guy that said tonight was pretty quiet. 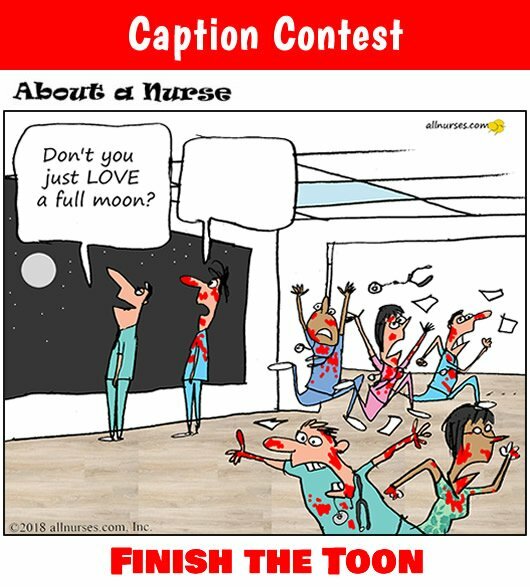 Clearly, this is your first time working on a full moon night. Umm... any time you want to clock in, we could use a little help. Halloween is around the corner so let's have some fun. This caption contest is different from others. What I want you to do here is Finish the Toon. I set the environment ... I started the conversation ... now, it's up to you to finish the toon. Congratulations CalicoKitty. You won $100! You won $100! Your entry was selected by the community as the best caption for our September 2018 Caption Contest - Select $100 Winner! Cartoon can be viewed at The 'Q' Word During a Full Moon. You know, it's only an Old Wive's Tale that people get nutty when there's a full moon. Yes, especially when combined with a fine bottle of polyethylene glycol. "Yes, the bloodletting has already begun". We have got to get rid of this mural. Carl, every night is a full moon at this hospital. Well the word "LOVE" might be a little strong!! !